As a charter user, we are giving you the opportunity to Start Trading along with our Brand-New E-Mini – Automated System Alerts with a Special 1/2 price offer. Give it a try and see your daily point-gains skyrocket – if it is not for you cancel at anytime and you will not be billed again. Here’s how it works:. Start getting our Trade Alerts Tomorrow – For Half-Price. Sign up and download our 100% Fully-Automated Desktop Alert Software. Fire it up when the ES is trading and follow the signals – trade on Sim for a couple weeks. Convince yourself that the signals can be traded profitably. We spent the first Half of 2017 testing and perfecting the system and now we are releasing it to the first group of users. 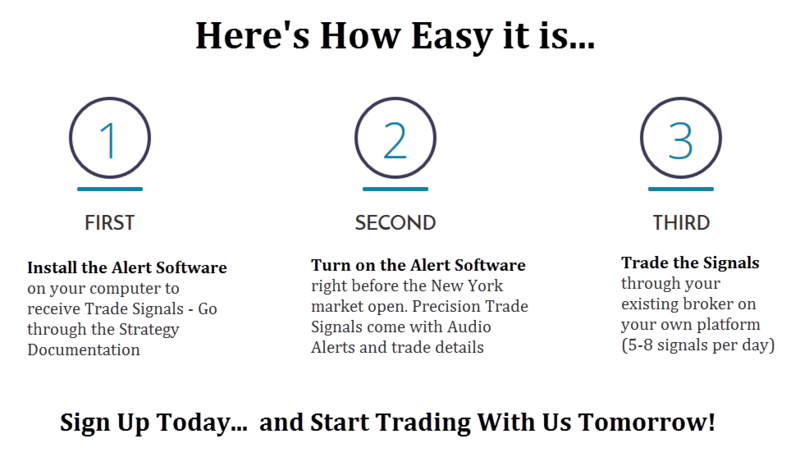 In addition to the Alert Software / Signals, we’ll also provide you with comprehensive training and strategies on how to trade along with the Alerts. This is a limited time offer and the price will double soon. Don’t miss out on the chance to lock in this price.